Download "LISTENING REVOLUTION THE. 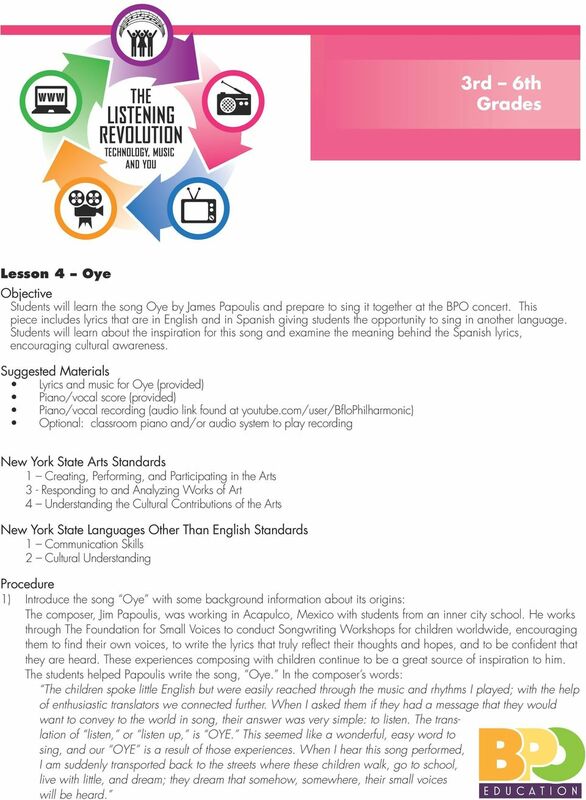 3rd 6th Grades"
1 THE LISTENING REVLUTIN TECHNLGY, MUSIC AND YU 3rd 6th Grades Lesson 4 ye bjective Students will learn the song ye by James Papoulis and prepare to sing it together at the BP concert. 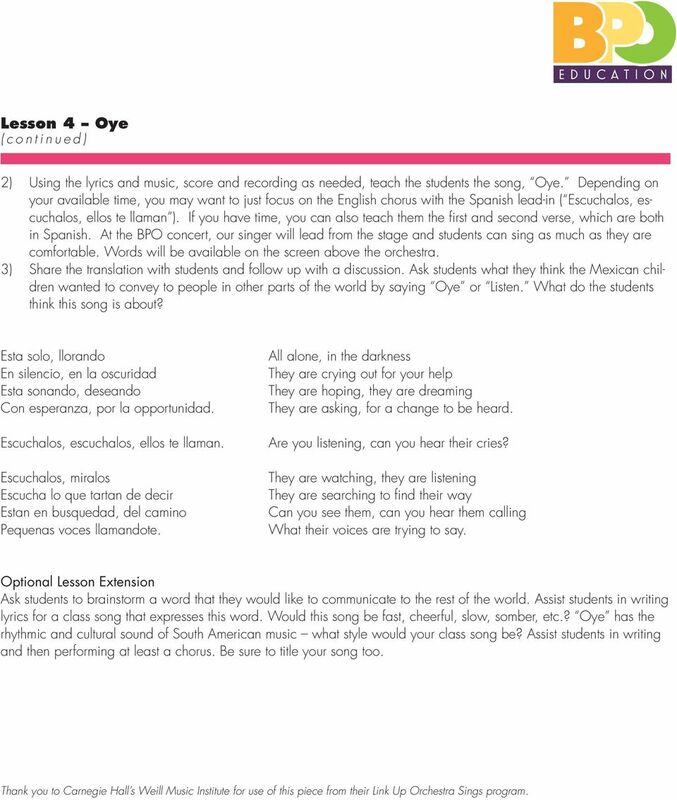 This piece includes lyrics that are in English and in Spanish giving students the opportunity to sing in another language. Students will learn about the inspiration for this song and examine the meaning behind the Spanish lyrics, encouraging cultural awareness. Suggested Materials Lyrics and music for ye (provided) Piano/vocal score (provided) Piano/vocal recording (audio link found at youtube.com/user/bflophilharmonic) ptional: classroom piano and/or audio system to play recording New York State Arts Standards 1 Creating, Performing, and Participating in the Arts 3 Responding to and Analyzing Works of Art 4 Understanding the Cultural Contributions of the Arts New York State Languages ther Than English Standards 1 Communication Skills 2 Cultural Understanding Procedure 1) Introduce the song ye with some background information about its origins: The composer, Jim Papoulis, was working in Acapulco, Mexico with students from an inner city school. He works through The Foundation for Small Voices to conduct Songwriting Workshops for children worldwide, encouraging them to find their own voices, to write the lyrics that truly reflect their thoughts and hopes, and to be confident that they are heard. These experiences composing with children continue to be a great source of inspiration to him. 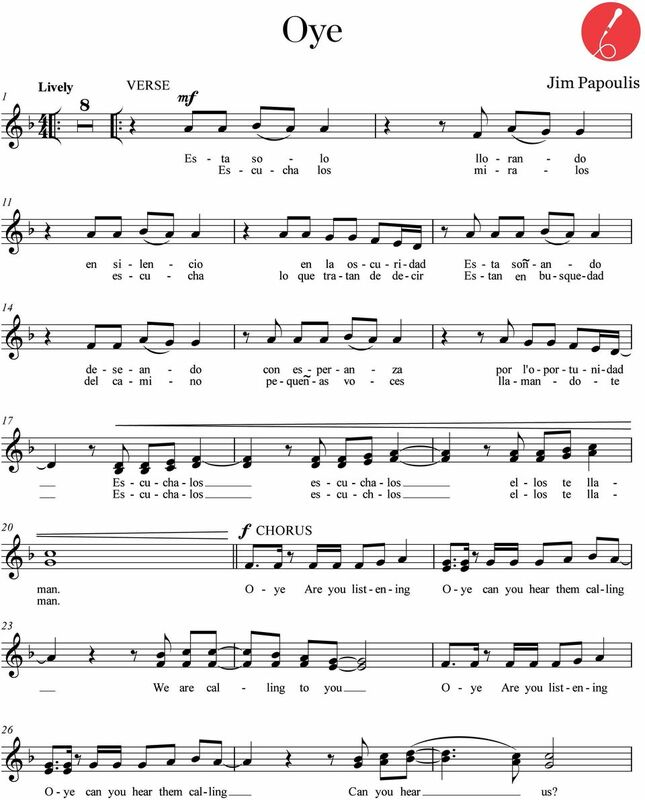 The students helped Papoulis write the song, ye. In the composer s words: The children spoke little English but were easily reached through the music and rhythms I played; with the help of enthusiastic translators we connected further. When I asked them if they had a message that they would want to convey to the world in song, their answer was very simple: to listen. The translation of listen, or listen up, is YE. 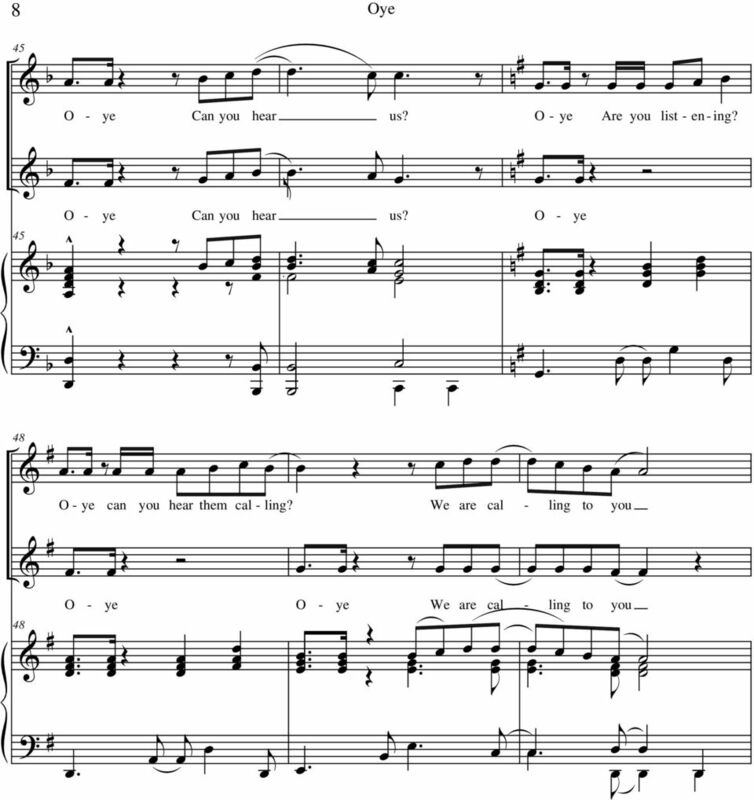 This seemed like a wonderful, easy word to sing, and our YE is a result of those experiences. 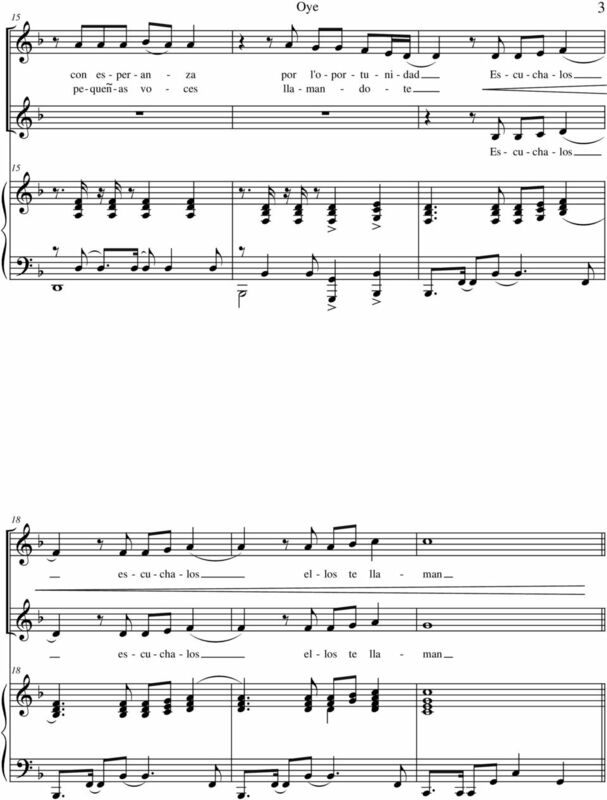 When I hear this song performed, I am suddenly transported back to the streets where these children walk, go to school, live with little, and dream; they dream that somehow, somewhere, their small voices will be heard. 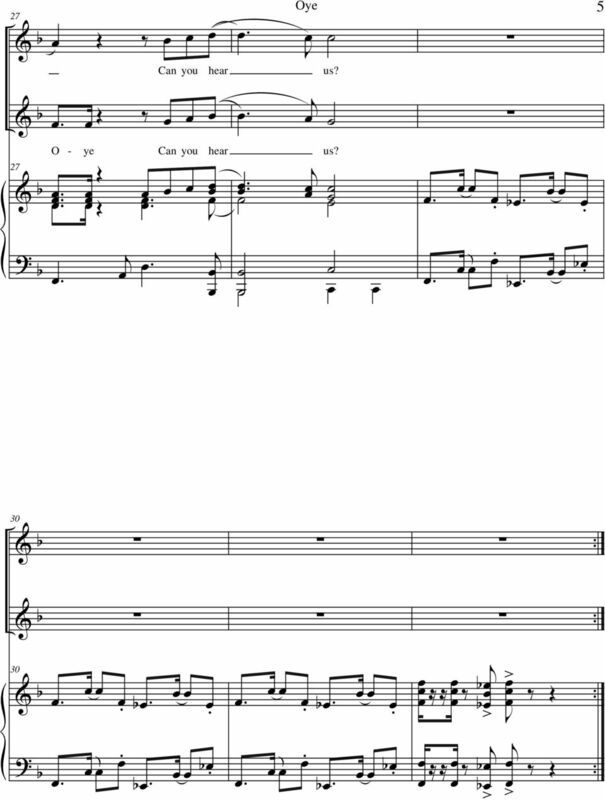 2 Lesson 4 ye ( c o n t i n u e d ) 2) Using the lyrics and music, score and recording as needed, teach the students the song, ye. 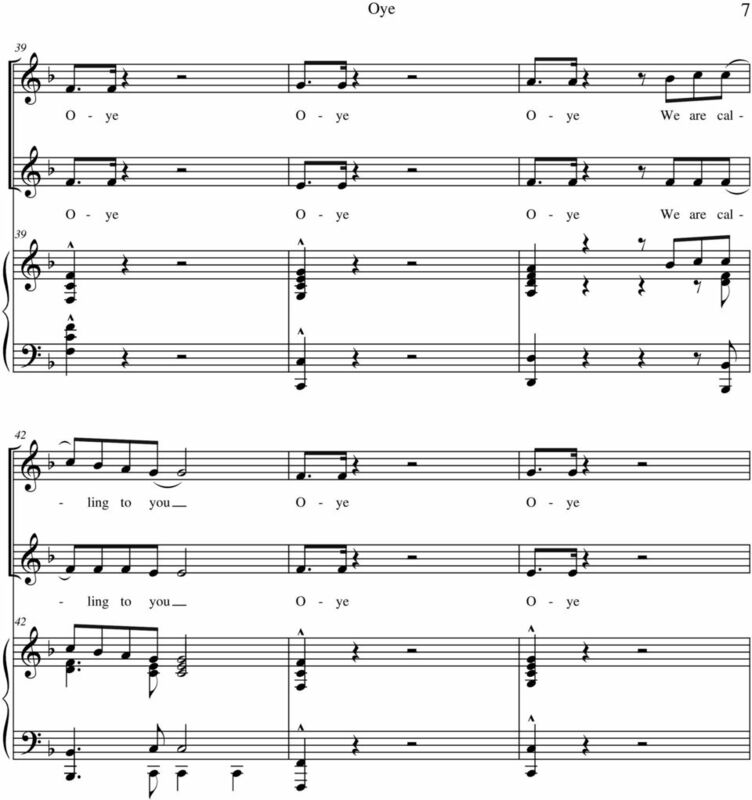 Depending on your available time, you may want to just focus on the English chorus with the Spanish leadin ( Escuchalos, escuchalos, ellos te llaman ). If you have time, you can also teach them the first and second verse, which are both in Spanish. At the BP concert, our singer will lead from the stage and students can sing as much as they are comfortable. Words will be available on the screen above the orchestra. 3) Share the translation with students and follow up with a discussion. Ask students what they think the Mexican children wanted to convey to people in other parts of the world by saying ye or Listen. What do the students think this song is about? Esta solo, llorando En silencio, en la oscuridad Esta sonando, deseando Con esperanza, por la opportunidad. Escuchalos, escuchalos, ellos te llaman. Escuchalos, miralos Escucha lo que tartan de decir Estan en busquedad, del camino Pequenas voces llamandote. All alone, in the darkness They are crying out for your help They are hoping, they are dreaming They are asking, for a change to be heard. Are you listening, can you hear their cries? They are watching, they are listening They are searching to find their way Can you see them, can you hear them calling What their voices are trying to say. ptional Lesson Extension Ask students to brainstorm a word that they would like to communicate to the rest of the world. 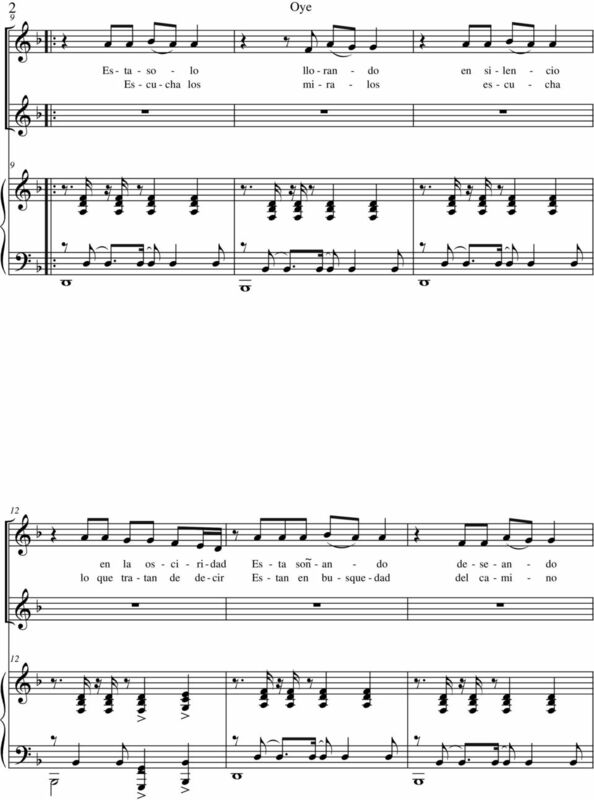 Assist students in writing lyrics for a class song that expresses this word. 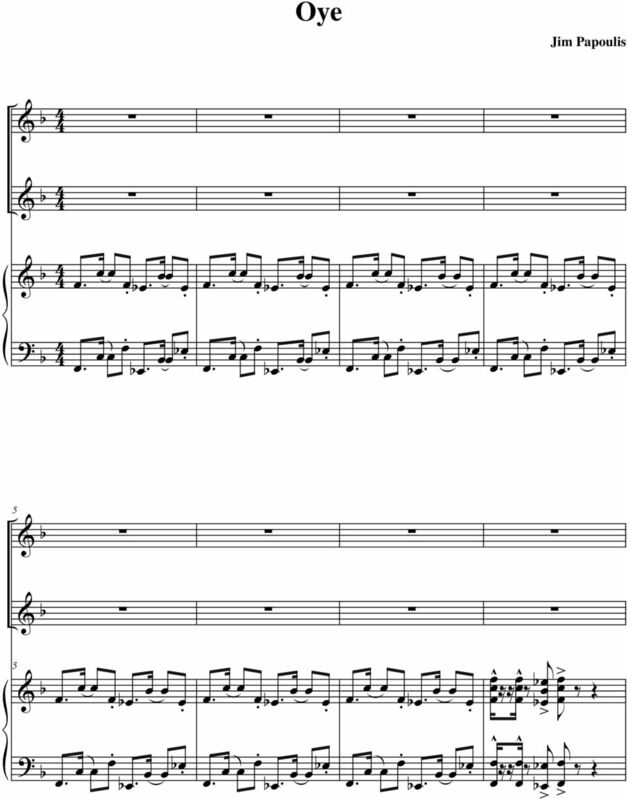 Would this song be fast, cheerful, slow, somber, etc.? ye has the rhythmic and cultural sound of South American music what style would your class song be? Assist students in writing and then performing at least a chorus. Be sure to title your song too. Thank you to Carnegie Hall s Weill Music Institute for use of this piece from their Link Up rchestra Sings program. Tiene una mesa para cuatro? SUMMER WORK AP SPANISH LANGUAGE & CULTURE Bienvenidos a la clase de Español AP! Telling and asking for the time. Canta, canta, canta. 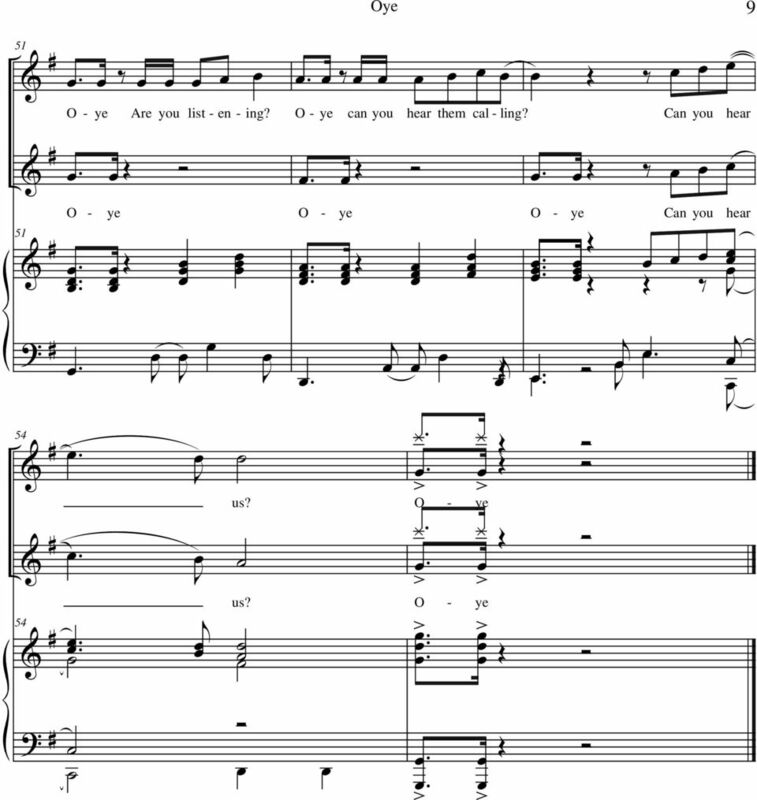 "Do" - Female Voice Level II. œ Œ. œ J œ œ. j œ œ œ # # j œ. . j œ. œ. > œ. œ. œ. œ. > j œ. j > œ. œ. > Û Û J. Come stà. Domenico Maria Ferrabosco (Bologna 1513-1574) Cantus. - ta, _e vo - lon - tie - ri M'al -le-gro _e can -to _en. Io mi son gio vi. Step-by-Step. Classroom Music II. Teacher Manual. emc notes inc. Global Music Lesson Plans Songs of greeting Congo, New Zealand & UK For ages range 7-11. Be courteous and respectful. - treat others the way you would like to be treated. 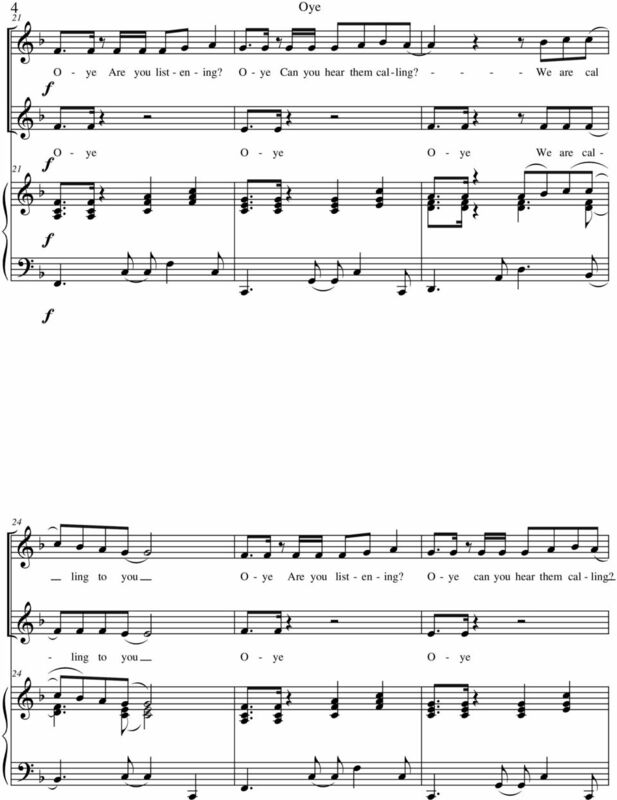 Mary Amato s Guitar Notes Songwriting Lesson 1 Mary Amato s Songwriting Lesson Understanding Song Lyrics as Poetry Read the lyrics (below) for the final song that Tripp writes for Lyla in Guitar Notes. 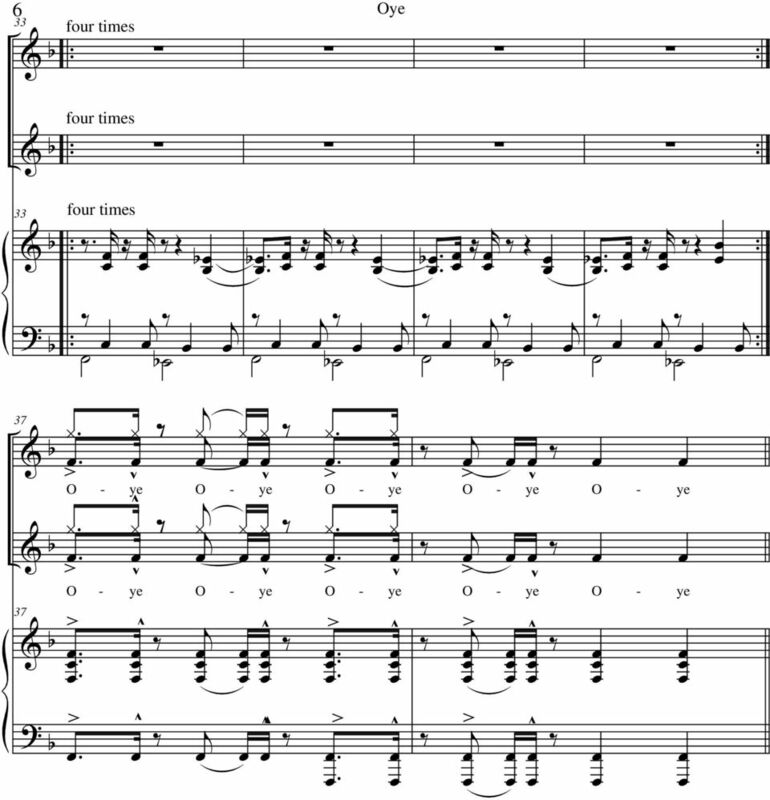 Uncover the mystery of what makes music tick, including concepts like tempo, meter, rhythm, notes, and rests. Assessment Report Card Comments Here and on the next six pages are a variety of comments you can use to help complete your report cards each term. It is sometimes difficult to find the words you need. 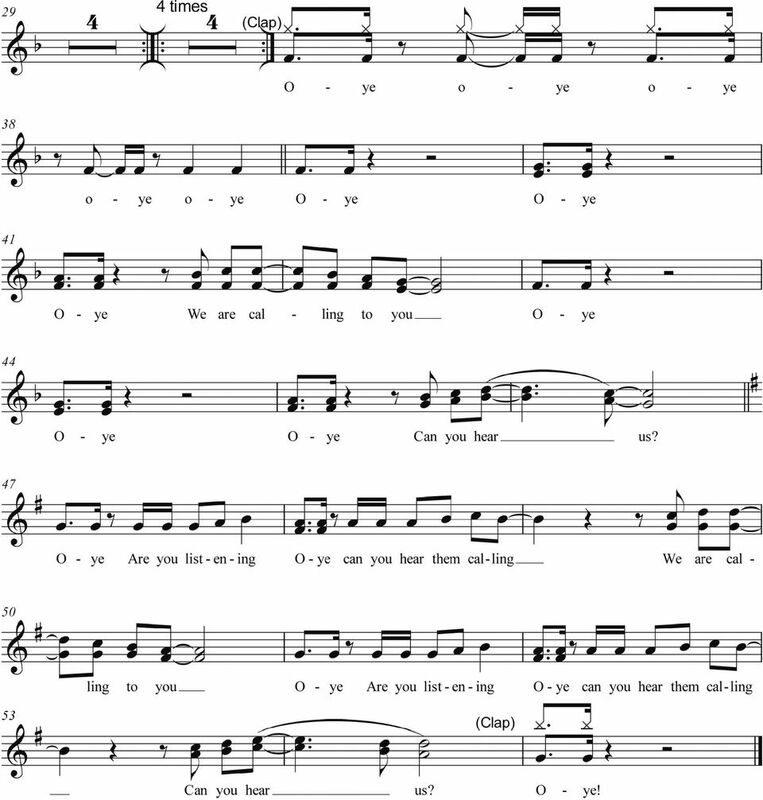 Put Your Song to the Tests By Pat & Pete Luboff We ve been listening to songs in a professional capacity for over 20 years, as songwriting consultants, workshop leaders, contest judges and Taxi screeners. Adónde vas? WHERE ARE YOU GOING? Activity. Materials Finger puppets S ILLY S ONGS I N S PANISH. English Version Where Are You Going? Adónde vas? Props: Arrow Scripture Memory v. Balloons & Marker Plastic Cell Phone & yellow visual Quiver for arrows Map of Guatemala Bible. name? is. teacher s name? Students comprehend the question, Cómo te llamas tú? Students answer the question using the phrase, Me llamo. B. Total for Major 58 semester hours. II. Liberal Arts 32 semester hours # May be double counted toward Major and Liberal Arts Requirements.